Production data acquisition software. 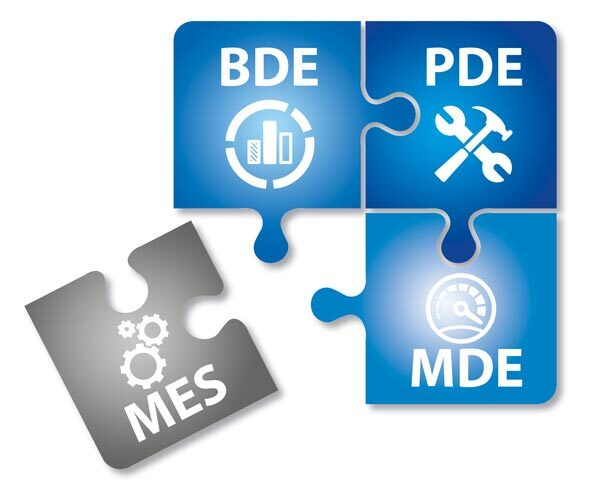 PDE system. VBASE. Transparent production through seamless data acquisition. Detailed traceability of all products. VBASE has an integrated library with function blocks that automate and simplify many standard procedures in the production chain. The existing functions can be adapted individually to the conditions and structures of any production processes. The automated recording of operating, machine and production data enables a close-up view of all running processes and production orders for all relevant departments. The continuous digitalisation and the networking of the processes with the dependent departments enable efficient production. And also for small batches down to lot size 1. Digital interfaces between production and administration enable a fast, paperless flow of information and form the basis for the maximum optimization of all processes. Pending production orders are transferred automatically to the production plants or the responsible departments in the necessary sequence. The status of orders is always transparent and the utilization of the resources is optimized and planned. Order-related production quantities and quality-relevant data are automatically captured and transmitted in real-time to higher-level systems, e.g. ERP. Please request our latest VBASE price list. By integrating time and effort plans, the utilization of machines and plants can be optimized and production and delivery times can be predicted quite accurately. The permanent archiving of all quality relevant data allows a maximum quality monitoring to be realized. VBASE has been used for many years for monitoring and quality assurance, e.g. in the production of food and pharmaceutical products. Respond directly to problems by alerting. In case of error and fault messages or when predefined limit values are exceeded, the notification system integrated in VBASE can automatically inform the responsible employees and departments via SMS or email. This allows you to react immediately to important events directly on the spot or with the VBASE Web Remote via a smartphone. With maximum connectivity into the digital age. 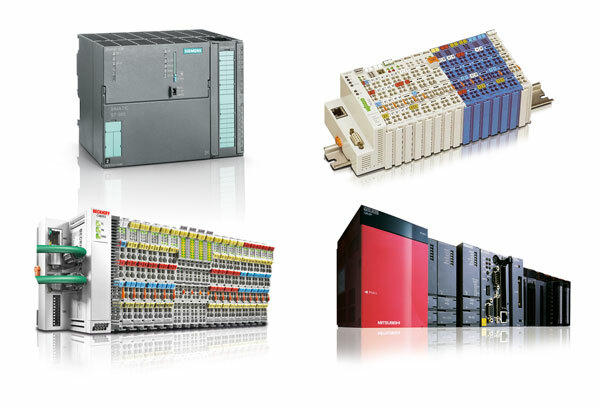 With the multitude of available manufacturer-neutral interfaces to a wide range of systems, VBASE also integrates machines and plants into a digital overall system. This enables a smooth transition to the age of Indutry 4.0. 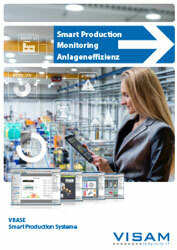 Smart production with intelligent HMI systems. Due to the functions contained in VBASE, unclear states (for example the definition of downtime reasons) are being concreted and promptly defined in dialogue with the operator on-site. Thus, only precompressed, relevant data is being recorded. An elaborate processing of data is minimized to the minimum. 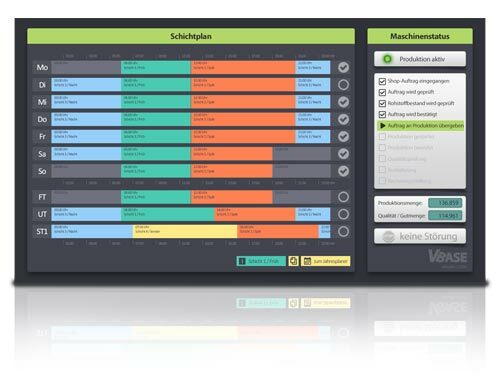 Based on the recorded production and stillstanding times and the recorded production quantities, VBASE calculates the overall plant effectiveness (OEE) and displays this continuously updated to the operator so that a permanent optimization is possible. By combining with other data (such as the regular capture and display of energy and resource requirements), individual machine dashboards can be created very easily, to help the operator to interact with machines and systems more convenient. 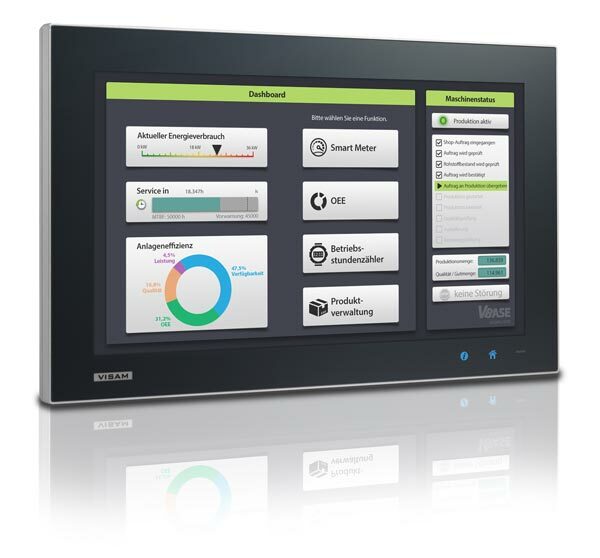 Learn more about the VISAM HMI systems. The visualization of all important states, consumption data and the maintenance status directly at the production facility allows the operator to operate plants and machines optimally and effectively at all time. This allows the minimization of attrition at maximum performance. The machine and plant maintenance are being planned by permanently recording machine states, production and stillstanding times, production quantities as well as sensor-determined data. With lower downtimes and less maintenance costs the efficiency of the production is increased.